"The Purr-Fect Crime"/"Zip, Zoom, Zow Kevin!" Selina Kyle's closest friend, her beloved cat, Isis, has teamed up with Snooky Wookums to steal a necklace with orange kryptonite inset. This newly discovered gem has a twenty four hour effect on animals giving them kryptonian powers! 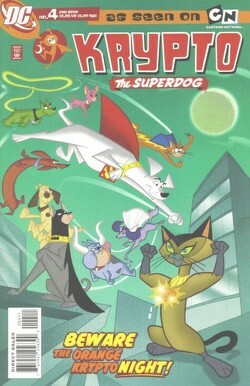 Unknown to the villains Krypto, Streaky, Ace and the Dog Star Patrol have been tracking Snooky and discover the two villains have been on a crime spree and rush to stop them! Naturally the heroes take a beating and have to plan out a better attack. Realizing they can't stop the cats while they are super powered they decide to foil their crimes instead, at least until the kryptonite wears off. It works and as the powers wear off the heroes try to discover where they've hidden the orange stone. What they discover however is that Snooky had double crossed Isis and stolen the necklace for himself. In revenge Isis helps the Dog Stars by damaging Snooky's escape craft engine. During the distraction Ace reclaims the gem. Beaten, Snooky uses his powers to retreat home to Mechanikat before the next twenty four hours are up. Krypto has a gruelling day of super deed and feeling severely drained heads home to relax. As he drowsily crawls into his kennel, Kevin rushes out and is disappointed that Krypto doesn't want to play. At this very same moment, Ignatius, Lex's evil and none-to-bright sidekick wanders into a research lab at Lexcorp. Sadly he's arrived at the end of the day and the scientists are heading home without testing their Time Differential Sequencer. The iguana can't help himself and activates it. Then it happens - time stands still! Kevin, protected by water is unharmed but is stunned to find all of Metropolis is stuck on pause. Compared to everyone around him, Kevin is able to move at speeds even Superman would be envious of. Investigating the effects Kevin discovers many accidents and crimes waiting to happen and being wholesomely good, he helps put right what might go wrong. During his heroic deeds he bumps into Wally West, The Flash! Flash listens to Kevin but advises him that a JLU member ought to take the lead and he should get home where it's safe. As Kevin heads home he sees his Dad and baby sister about to be crushed by a runaway van, but is unable to correct time to save them and rushes home! Wally follows the trail of the time effect to Lexcorp and deactivates the effect returning time to normal. Kevin races back as time restarts and is relieved to see Krypto saved his family. Just before time restarted he had gotten home in time to warn his dog about the danger and disaster was averted! What a day! A tired Kevin yawns as he sinks into his pool. Krypto however has had a long rest and now wants to play! Story - 3: Another duo of stories, providing fun, comedy and adventure in a much needed and refreshing way. The only gripe I have this issue is that the stories focused far too much on his supporting cast, not our favorite canine! Art - 5: As usual this artwork continues to match the high standards we're used to. Nothing negative to say except - more Krypto please!! Can we have character profiles for people not familiar with the show? Cover Art - 3: Another fun cover! Isis doesn't look too 'super' or threatening though!